If you are trying to keep your kitchen functional, a few pieces of plywood, cut to size, can replace your counters for a while. This project will take at least a week and a half and likely longer depending on weather conditions and drying times. 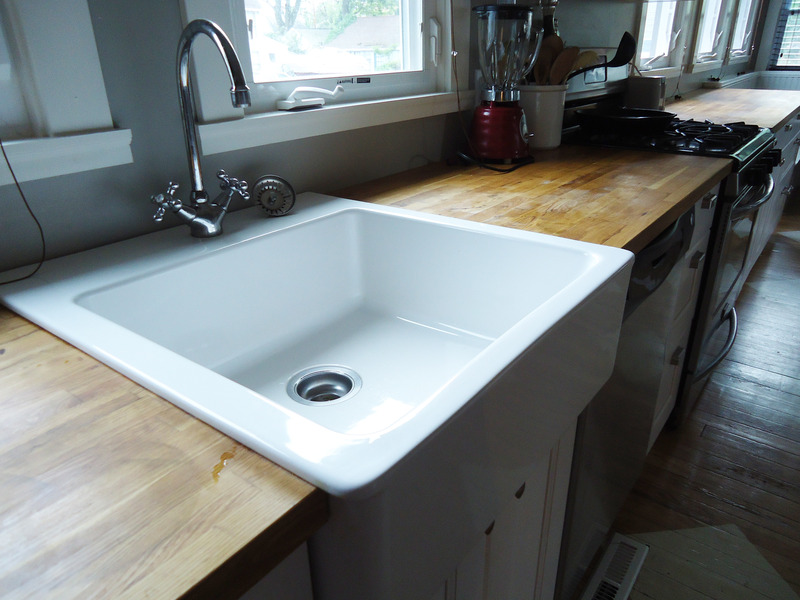 I have wanted to stain our IKEA butcher block counter tops since the first day that we installed them. For one thing, I prefer the darker wood tones that are trending right now. The counters were also the last light-toned wood surface left in the kitchen after the breakfast bar and trestle table renovations. 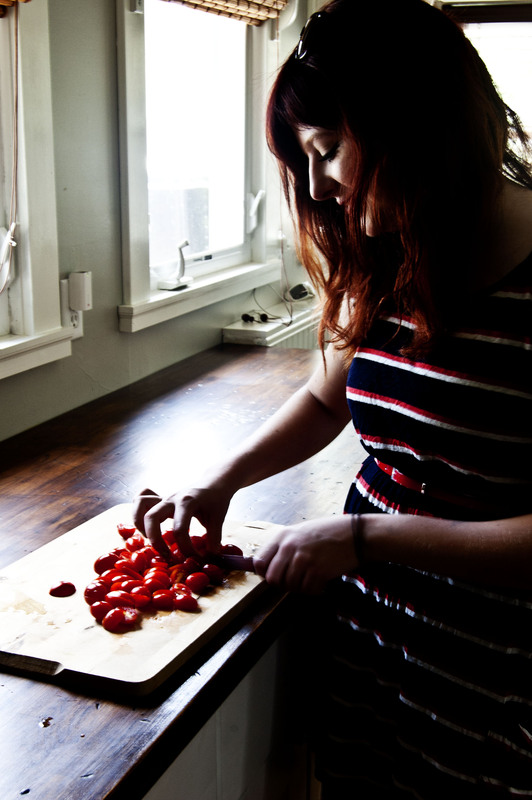 Butcher blocks also tend to wear with repeated use and need to be re-oiled frequently. Here are the kitchen counters before. First we replaced the counters with plywood so that our kitchen could continue to be operational. Then we moved the counters outside on a sunny Saturday afternoon. After an unfortunate couple of days trying to get the butcher blocks stained in poor weather and very tight conditions, in the back room, the stain was not looking too even. To add insult to injury, I also slipped over one counter and sent a brush flying with stain circling in a spray over a newly wiped portion. So part way through, I decided to distress them to make all of the uneven stain problems, existing water issues, and general lack luster appearance look intentional and cooler. 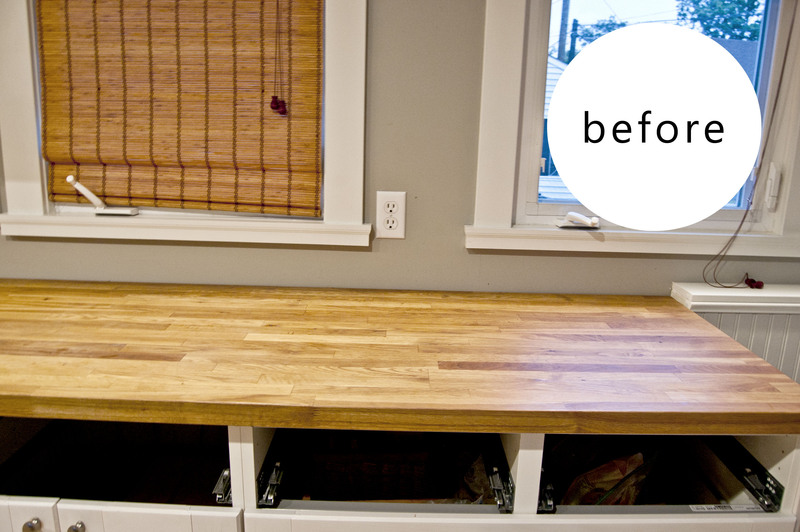 Here are the steps that I went through to get to a distressed, reclaimed-looking counter top out of an inexpensive Oak butcher block. Please note that normally, if you were to distress in the proper sequence —like making a decision to do so before you are half-way through the project— you would begin by distressing the wood. But that is not how I did, and it still worked out fabulously. 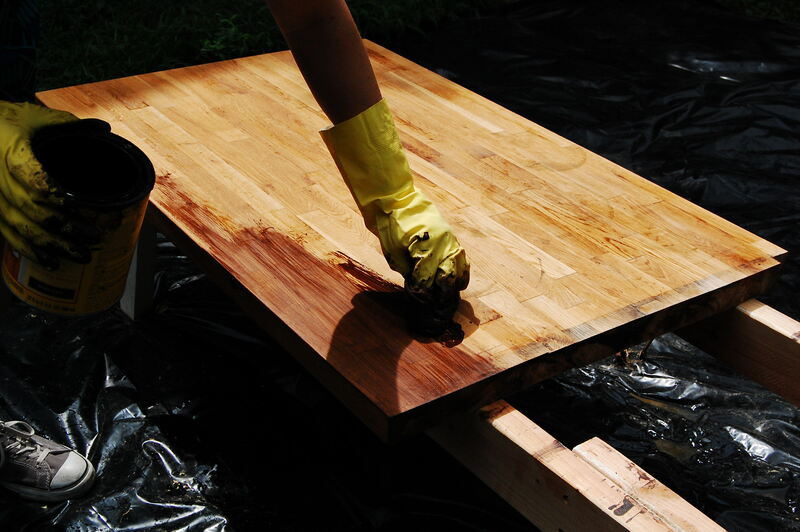 To begin, we sanded the counters with a pad sander using 100 grit then moving to 150 to get a smoother finish. 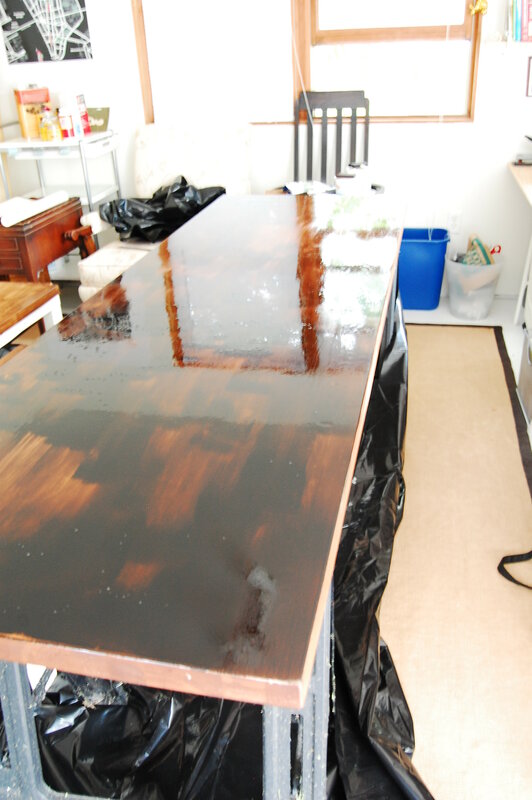 We had previously oiled the counter tops with the recommended IKEA oil and so were a bit concerned that the stain would not permeate the wood evenly. We tested an extra portion that we cut off during the banquette renovation. 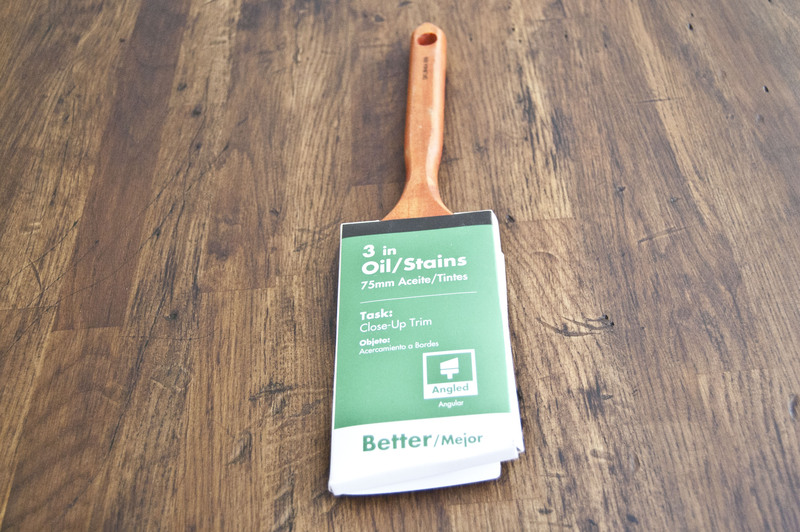 On one half we used pre-stain wood conditioner followed by a quick layer of stain and on the other we just applied the stain. We decided that because these counters are Oak —which is not a soft wood like pine— and because we had saturated these counters with oil previously, that we would just apply the stain directly onto the counters and skip the preconditioning step. And sanded and sanded, being careful to sand with the grain. 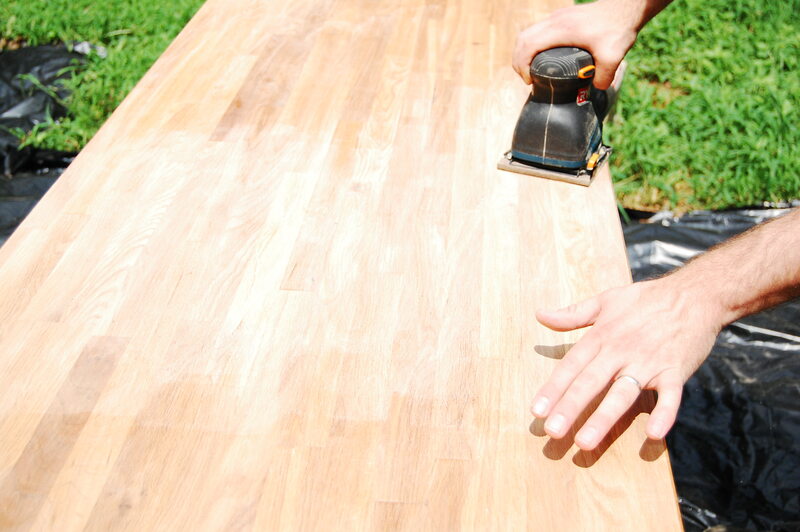 It just needs to feel smooth to the touch but you do not need to go crazy with sanding. The counters are already pretty smooth and come pre-sanded. Once the sanding was complete, we made sure to wipe it down thoroughly. Then we applied the stain. If you are using the IKEA pine tops, instead of the Oak, I would highly recommend treating them with a pre-stain conditioner first. 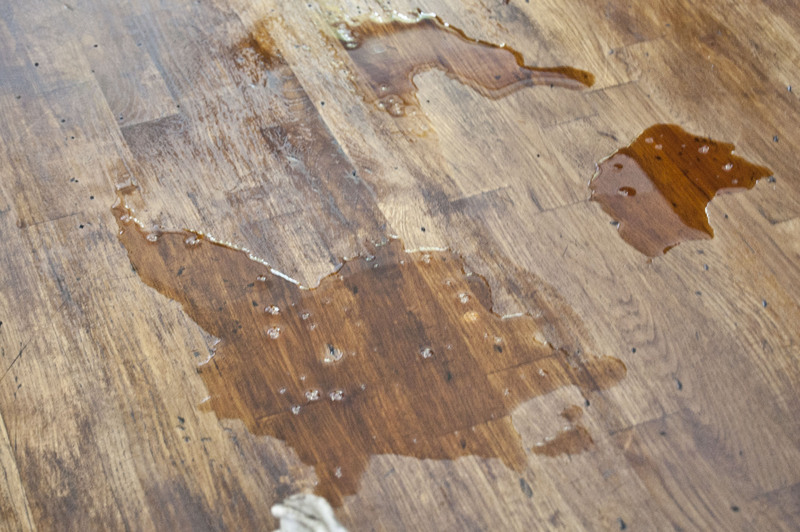 You can choose from a variety of stains but oil-based ones work the best for this job. I usually use a gel-stain because it is thicker and absorbs more evenly. Once again, these are Oak so the regular stain worked best. I did start with gel-stain . . . and it was very hot and humid, which is when I ran into some trouble. Usually, I do not have issues with gel stain drying too fast as I long as I work quickly and apply it with a rag instead of a brush. This time though, it was close to 95 degrees outside, and the stain dried more quickly than I could wipe it off. I am a bit obsessive when it comes to wood finishing, and it actually did not look all that bad when I was done with the first coat. I do not have a picture of this stage because we were caught in a flash rainstorm and had to move everything inside very quickly. The color I chose is Hickory which is a nice medium-dark stain color that is warmer than Walnut but not as burgundy as Mahogany. 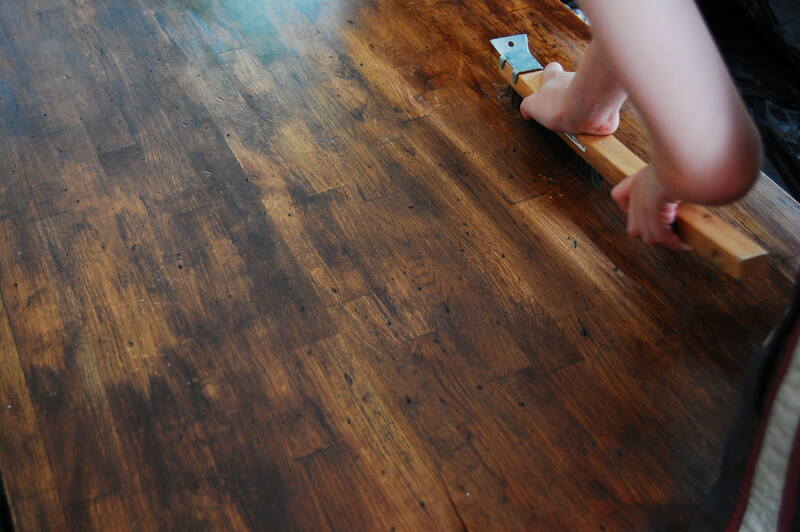 Once again, when applying the stain, you will want to make sure that you apply in the direction of the grain. I generally apply two coats of stain. In this instance, I changed stains after the first coat from gel stain in Hickory to regular Minwax oil stain in Dark Walnut. The second coat, I applied with a foam brush, inside. The weather is just too unpredictable to do this kind of work out-of-doors. A garage would be handy for this project. 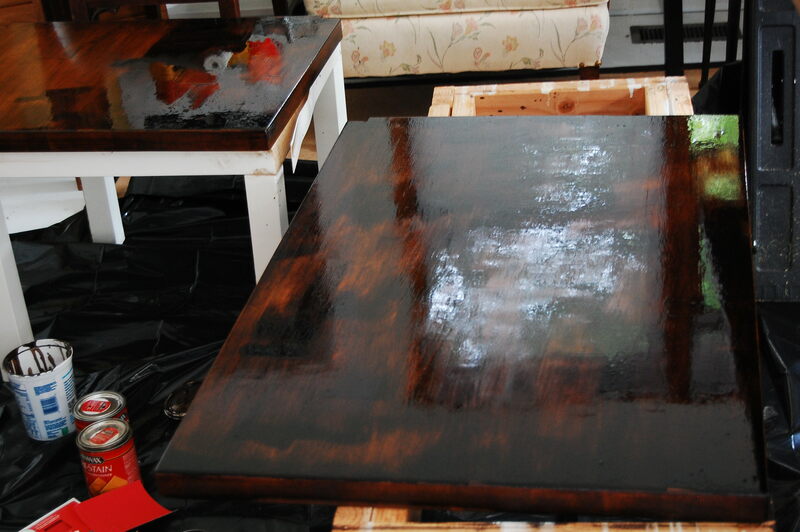 Below, you can see that the second coat of stain is fresh, wet and soaking in. Do not panic if it looks dark, when you wipe it off, it will be considerably lighter. I let it sit with the stain for about five to seven minutes. Then I wiped it all off with an old white undershirt. White cotton T-shirts are the best kind of rags. 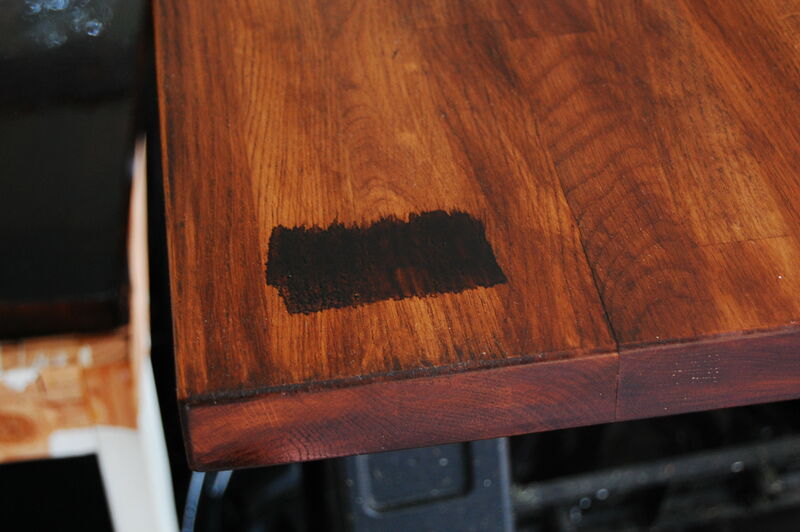 You can see in the picture below how light the stain comes out, once you wipe it down, compared to when it is applied. Then, as I was touching up a smaller portion of the counter, I slipped, sending a foam brush full of stain, flying across the room. 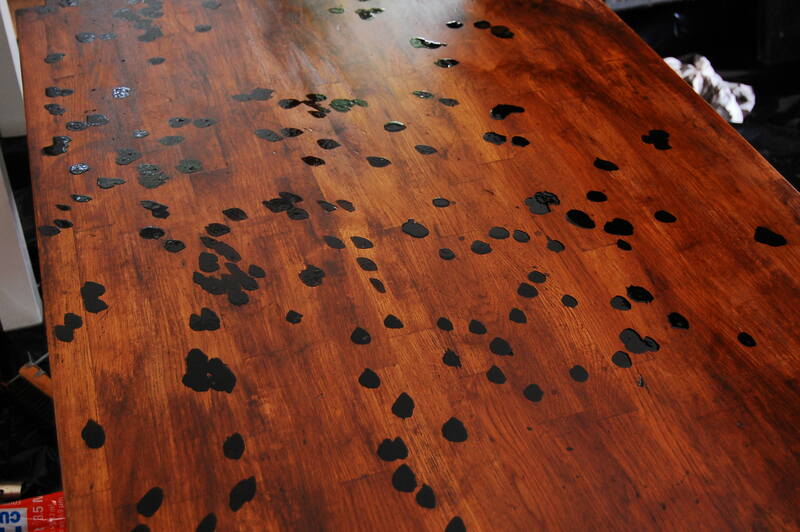 New stain spots landed all over the just-wiped large counter length. When I tried to wipe it up, it pulled the under layer of stain leaving light colored spots all over the surface. That is when I decided to distress the counter tops. As I mentioned earlier, normally you would do this before applying the stain. But, you know . . . it worked alright. Better than alright, actually. 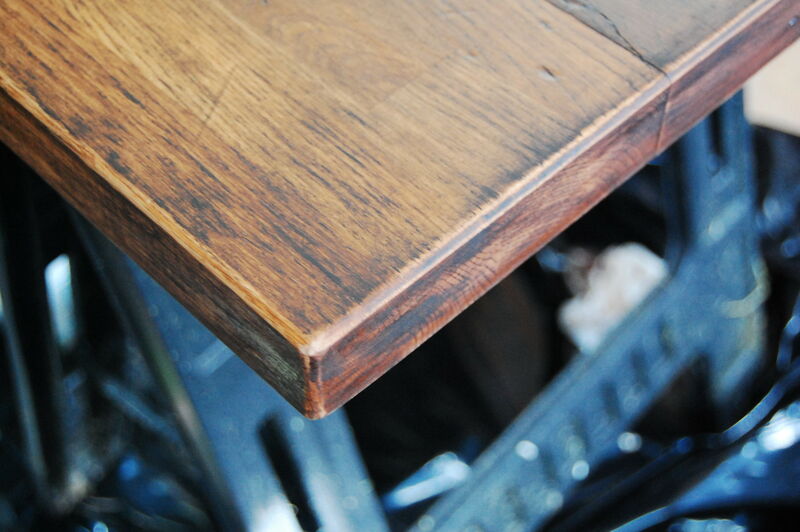 First, I sanded some areas down a bit, focusing on the edges —where you might expect some wear on an old bar top. Then I added more stain but in streaks this time. I let it sit for another five or so and wiped it down. 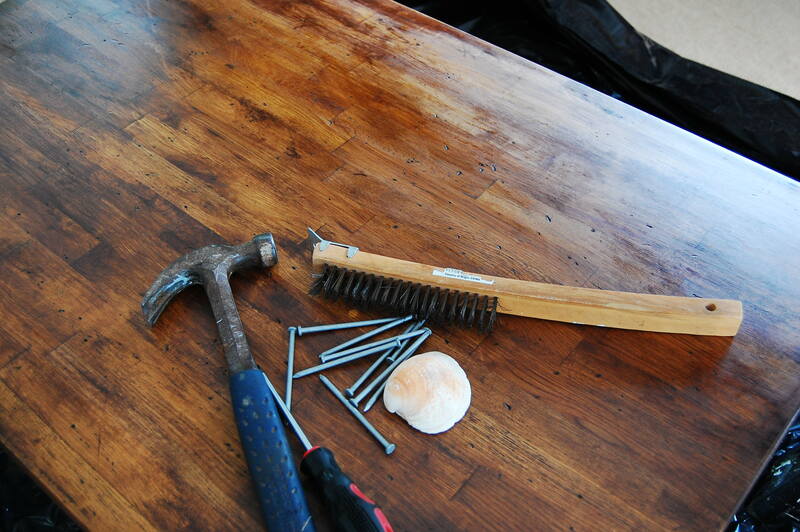 Then I used a variety of tools to beat the top up a bit . . . OK, quite a bit. Yes, I even used a seashell. My house is full of them because we live near the beach. 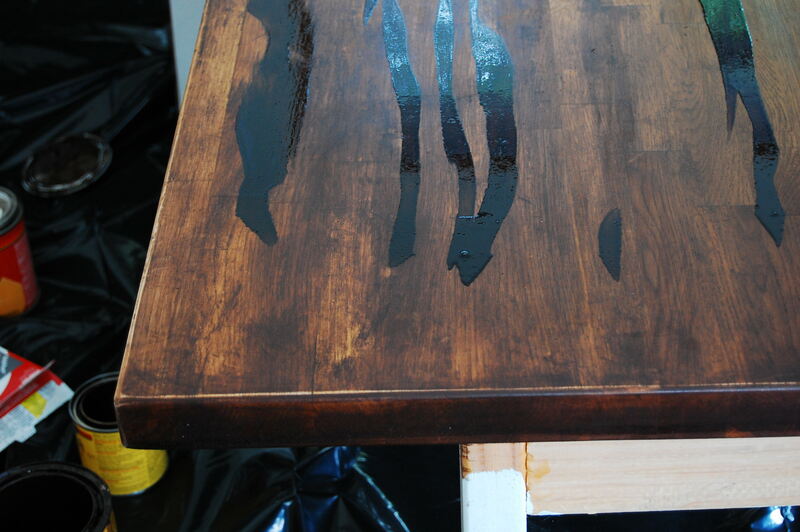 The counter in the image above has already been distressed, re-stained in spots, and wiped down with a rag. I just couldn’t take pictures while actively distressing the counters because I was working alone. Mr. Cool did not know that I decided to go this route until he saw a post about it on FB on his train ride home. I distressed a small segment first, just in case he did not like the outcome. The Instigator helped for a while. When Mr.Cool got got home he said, Cool! So I distressed the rest of them. I found that the best “technique” was just to keep it looking natural by not getting too patterned with the dings. I liked using the hammer and the large nails for the larger dings, banging the side of a screw into the counter for an interesting pattern, and the seashell for scratches. You will want to make sure not to create large surface areas of splintering, because you do not want to have to sand it all over again. 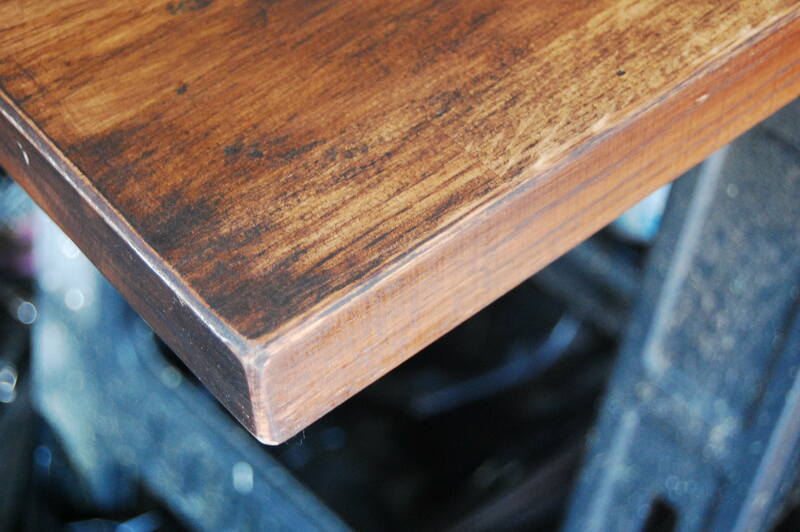 Sometimes you will have to sand the area right around a ding or scratch if the wood is raised and rough. The idea is that this is supposed to look like old damage wood, weathered and worn from use. You can watch a video of someone distressing boards here. Once you make the dents and scratches —especially if you have already stained your counter— you will have to apply stain to the dings to make it look authentic. Otherwise, these areas look freshly damaged. I read about one DIY where a woman applied India Ink to the dings to get a nice black, but I did not find this necessary. I just used more of the same stain, applied in spots to the damaged areas. Once these soaked in for a few minutes, I wiped it down again. I let the stain dry overnight, especially since I kept adding more to it, which increases drying time. Then I let it dry another night because the humidity was at 90%. Then I let it dry another night, with an AC unit blowing in one window, and a fan in the other to get a nice cool cross-breeze. When the stain was still a bit tacky, but close to being dry, I used some coffee and coffee grounds to lighten and warm the color of the counter a bit more. It did not make a huge difference but the subtle change in color was noticeable. The water in the coffee also cut the rest of the oil stain’s tackiness and made the counter SMELL delicious. 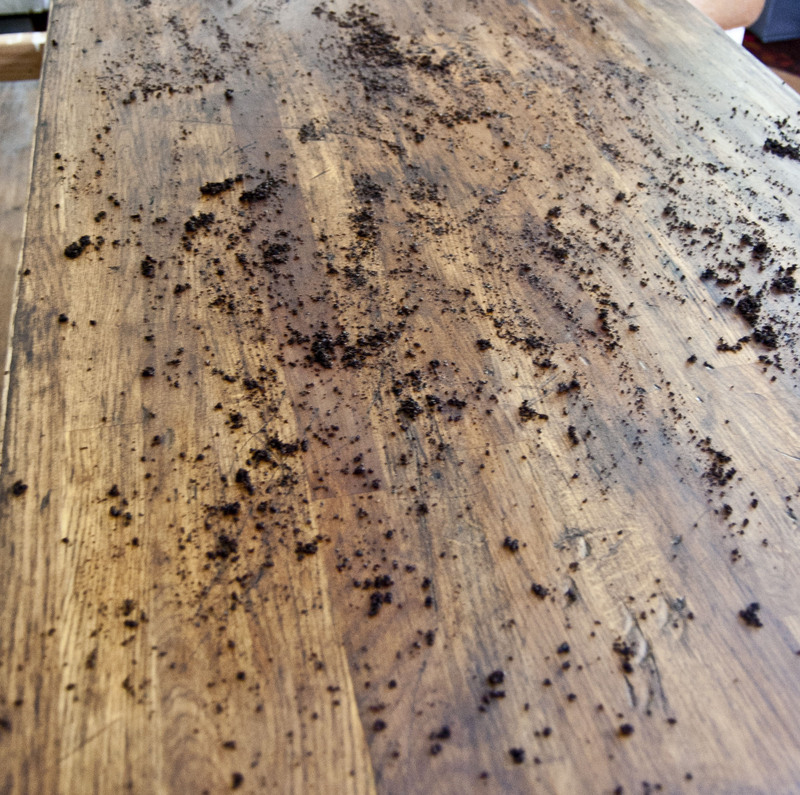 I let the coffee and grounds soak in for a couple of minutes and wiped the counters clean. If you would like to keep the color very warm and on the lighter side, you can stain the counter entirely with coffee and skip the stain. For me, this would not have provided a dark enough finish to match the rest of the woodwork in the kitchen. At this point, I went on vacation for a few days. 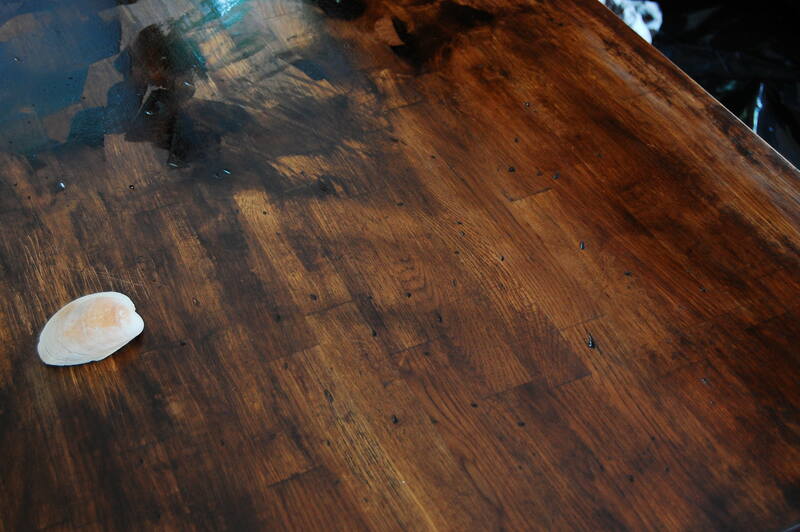 Leave the counters to dry at least overnight before applying the first topcoat. You will want them to feel mostly dry to the touch. When I came back, I sanded the edges a bit more. 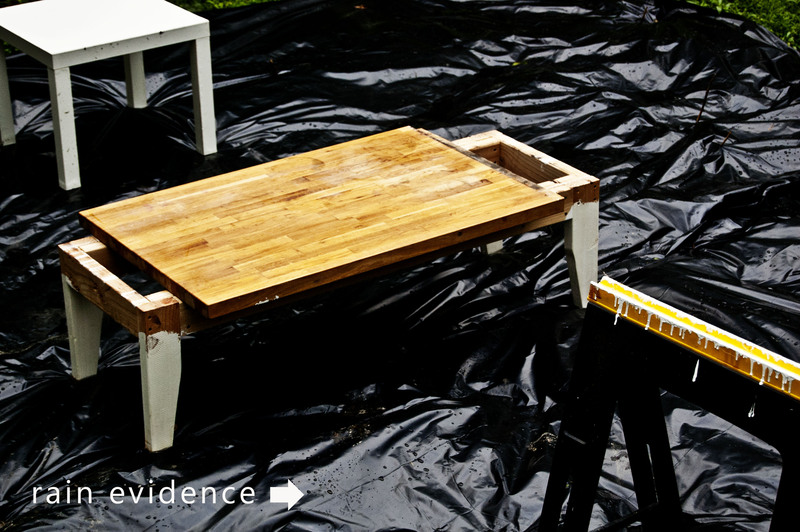 I also sanded a couple of areas near some of the heavier damage on the top, both using a fine grit 150 sandpaper. By hand is best. I found that at the edges, if I held the sandpaper in both hands and ran the sandpaper around the counter edge like I was shining a shoe, I got a nice even, natural-looking wear. Then I wiped it down thoroughly with a tacky cloth. A bit spendy but worth it for an ultra dust-free clean. You can use reuse them until they are not tacky anymore. 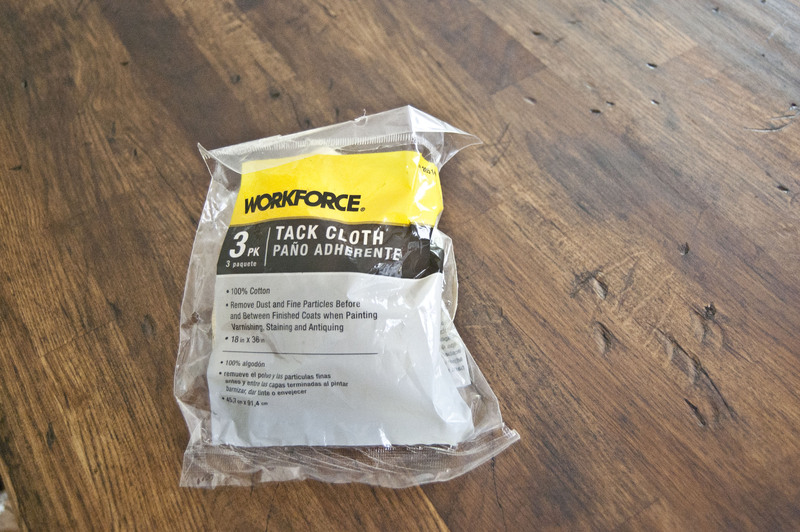 The two things that I would not skimp on are the tack cloth and the brush for applying the final topcoat. These two items will make this process a bit easier. At this point, you are pretty much in the last stretch, but you still have some days to go before the job is complete. Before you begin to apply the Waterlox —read more about why I love Waterlox for top coats here— make sure that you have very good ventilation! This stuff is strong, stinky, and will give you a headache if you inhale too much of it by working in a closed-up room. Trust me on this. To finish the counter with Waterlox, just pour some of it into a plastic container (large yogurt containers are great for this purpose) and apply in a thin layer in the direction of the grain, using the oil brush. This will go fairly quickly, which is good, considering how strong it smells. At first, it will look like there are dry patches and wet patches. This is normal. Do not obsess over this step. Just lay it down evenly and quickly (remember to get all of the sides and underneath a little ways in) and let it dry for 24hours before re-coating. You may need to let it dry longer if you live in a humid climate. I would strongly suggest applying a minimum of four coats and preferably five, or even six, to a kitchen counter top. You want it to stand up to water, messes, and heat. I applied the first few coats without doing any sanding at all. Then I noticed that the edges were not looking as worn as I wanted, so I sanded them again, lightly, making sure to wipe the residual sawdust off carefully. After the last coating dried, I buffed the counter out with some steel wool to make it nice and smooth, and to give it that satin sheen. I am not a fan of glossy finishes on wood. Waterlox takes some time to harden. We popped our counters back on for a dinner party because we are vain. Don’t do this. Let it set up for a few days and treat it with TLC for a few more weeks . . . if you want it to last. I am glad that we re-installed the counters out before our friends came over because one of them asked if the counter was made out of old-reclaimed wood and I responded, No, but I love you for thinking so. Everything looks good on the counters now. 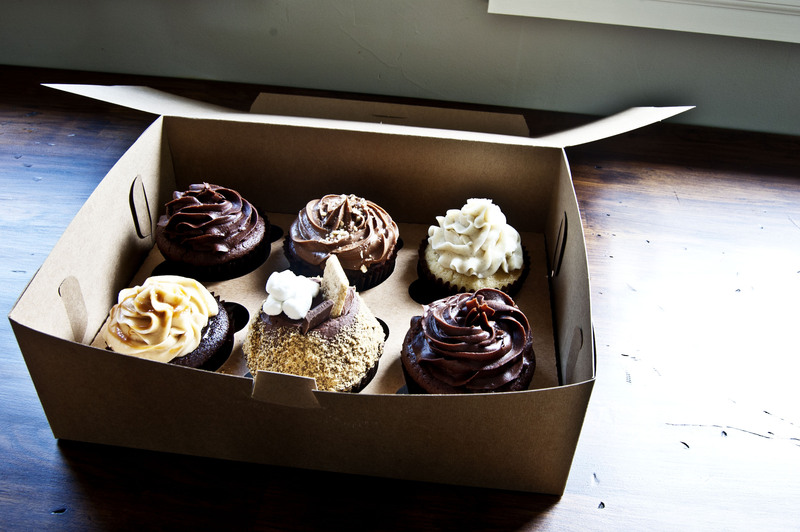 And cupcakes. Of course these would look good anywhere. 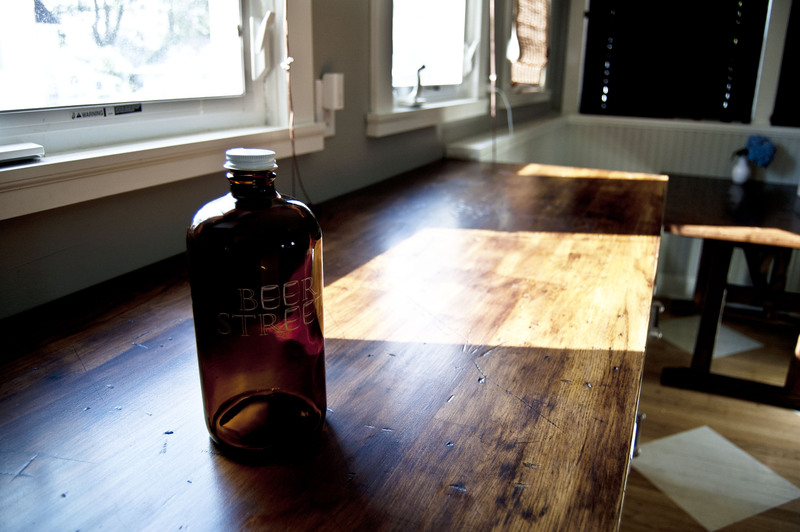 This beer growler from my favorite specialty beer shop in Brooklyn, Beer Street that a friend brought to the get-together. 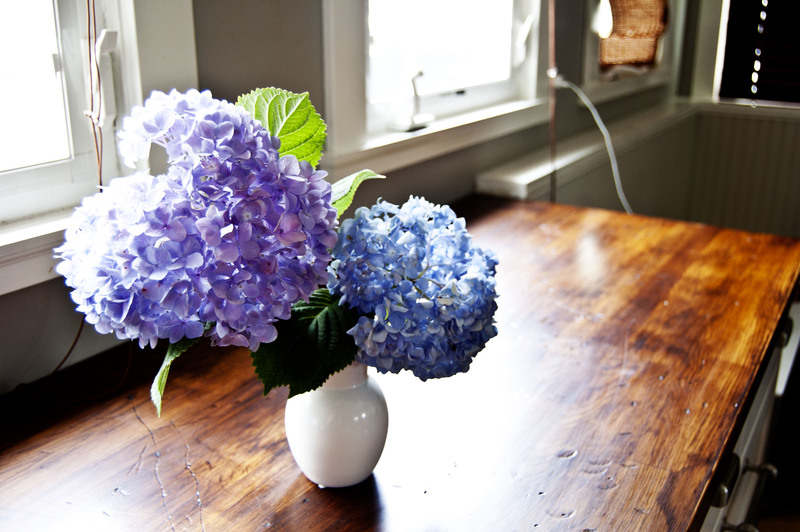 These hydrangeas from my garden. Looks amazing! I love it. Thanks! I could not be happier with out they turned out. And so far so good. They are holding up wonderfully. Wow… wonderful work. 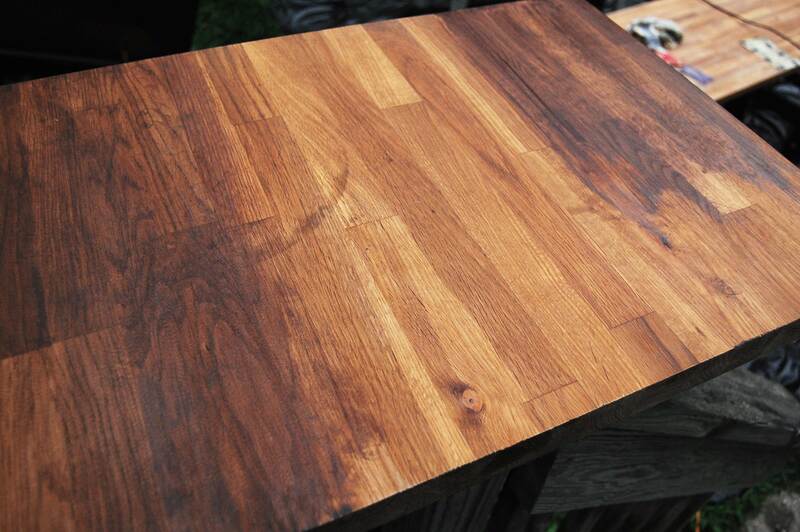 This is the best ikea countertop finish i’ve ever seen. Thank you! I could not be happier with it and it is holding up wonderfully. Isn’t there a website ‘pimp my ikea’ or something…this should definitely be on it! A labour of love. I should totally submit it to IKEA hacker. Thanks for the great idea! So how do the counter look now? I was a few days away to committing to honed granite when I came across your blog. 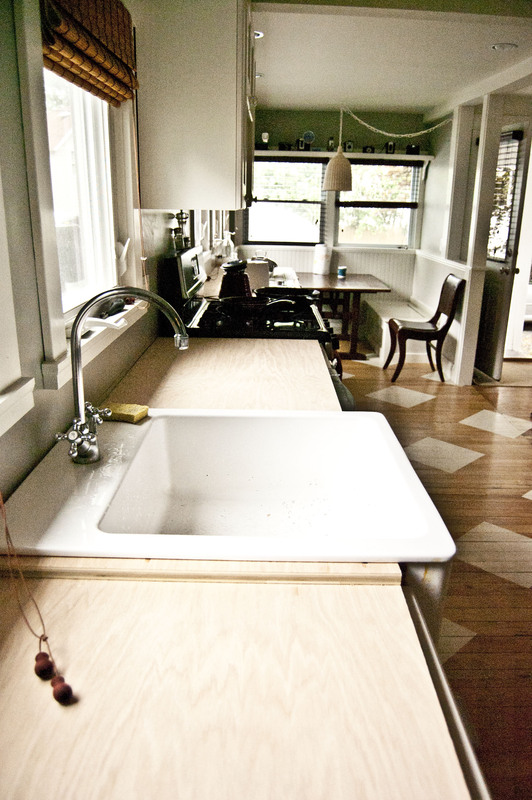 Love the warmth and character of these countertops. Have they yellowed and did you need a full three weeks to complete the project? Thanks for taking the time to answer my questions! Hi Erin! Thanks for visiting. I have taken some time off of the blog because of my crazy work schedule so just saw this comment tonight. If you are still interested, the counters are holding up beautifully. No yellowing. The three weeks was mostly because of lack of time on my part but that said if you are using Waterlox, you will want to let it set up before any hard use. 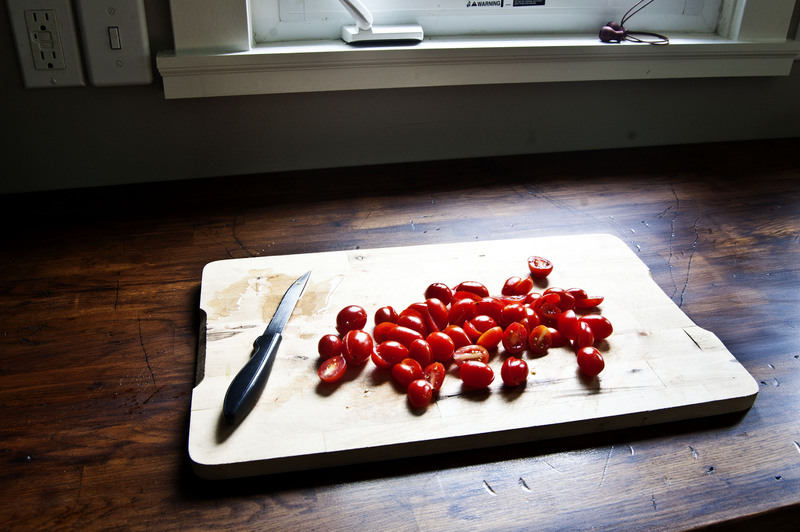 We are generally careful to use cutting boards and to clean up water spills but overall we are busy people and the kitchen gets and stays messy frequently. They are holding up through some serious wear and tear. The one complaint I have is rolling pastry because of the dings…so I would suggest getting a pastry cloth to roll out any dough. Good luck! I must say, the cupcakes were the best part of this.